Used Performance Boats and Brokerage Boats are our specialty! Take your time while you shop comfortably indoors, out of the rain, snow, or heat! Need service on your boat? No need to look elsewhere. We are your full service dealer before, during and after the sale. We have been meeting and exceeding the needs of our customers for over 40 years. At Grand Sport Center, we believe that boating should be fun and carefree for the avid performance boater, the family boater, and every boater in between. Since our inception in 1973, Grand Sport Center has earned and accumulated years of experience in selling and servicing boats. We have two locations in the Chicagoland area to make buying and servicing easier for our customers. Both locations are staffed with year round master and certified technicians and possess complete repair centers for mechanical, cosmetic, and fiberglass repairs. 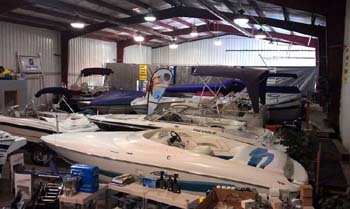 Grand Sport Center specializes in featuring pre owned premier performance boats such as: Donzi, Velocity, Cigarette, Baja, and are a servicing dealer for Four Winns. We also have a diverse stock of pre-owned boats. While a Baja dealer, Grand Sport Center earned a spot as one of the nation’s top dealerships as well as Chicago’s number one performance dealer. Grand Sport Center has acquired 40 years of experience in selling and servicing Baja. Every member of the Grand Sport Center family possesses an enthusiastic approach to boating. We all share the same thrill as our customers while out on the water as we boat as much as possible. Whether you are a first time buyer or a repeat buyer, Grand Sport Center promises to find the right boat that fits you. At Grand Sport Center Inc., our team receives many calls, notes and emails from our customers expressing their satisfaction. CLICK HERE to read a few of the notes we have received.